A snippet of a conversation at the bridal shower held last weekend. 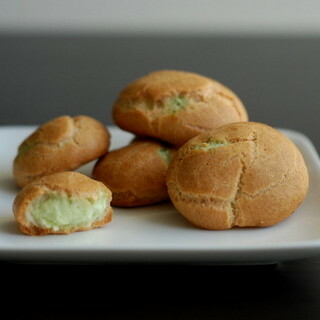 Profiteroles, or cream puffs, do taste light largely because of the hollow pastry and the usual whipped cream filling. But it’s just like that light and airy cheesecake I made the other day – tasting light and being light are not the same thing. I suppose I can call this week Deceitfully Light Week. If I can squeeze in my last recipe tomorrow, it definitely will fall right in line with that theme. It’s been a long time since the last time I participated in a Hay Hay it’s Donna Day! and there have been some good changes. Suzana’s the host for Hay Hay it’s Donna Day#20 and chose choux for the event. And as much as I wanted to stick with Donna Hay’s recipe, I found one at Cook’s Illustrated that had all the detail I felt I needed for my first time making the choux. There must have been too much detail as I overlooked an important one – the size of the pastries. I made such tiny puffs, barely any cream fit inside them. That aside, I was pleased with how they turned out, and now have found a new love for choux. 1. Adjust oven rack to middle position and heat oven to 425 degrees. Line large cookie sheet with parchment paper; set aside. 2. Beat eggs and egg white in measuring cup or small bowl. Set aside. 3. Bring butter, milk, water, sugar, and salt to boil in small saucepan over medium heat, stirring once or twice. When mixture reaches full boil, immediately remove saucepan from heat and stir in flour with heatproof spatula or wooden spoon until combined and mixture clears sides of pan. 4. Immediately transfer mixture to food processor and process with feed tube open for 10 seconds to cool slightly. With machine running, gradually add eggs in steady stream. When all eggs have been added, scrape down sides of bowl, then process for 30 seconds until smooth, thick, sticky paste forms. 4. Fill mechanical pastry bag with paste and pipe into 1 inch mounds on prepared baking sheet, spacing them about an inch apart (you should be able to fit about 24 mounds on baking sheet). 5. Bake 15 minutes, then reduce oven temperature to 375F degrees and continue to bake until golden brown and fairly firm, 5 minutes longer. Remove baking sheet from oven and cool. 6. With an electric mixer, beat heavy cream on medium until it holds soft peaks. Add in sugar and sifted matcha, beat again until soft peaks form. 6. Clean mechanical pastry bag and fill with matcha whipped cream. Using the filling tip, gently pipe cream into choux. 7. Store puffs in freezer, thaw right before serving. Lovely profiteroles. I love the added matcha flavour to these! Thank you for your participation, Talida. Mmmm yum… such delightful little choux. Love matcha! Pretty! The green looks so refreshing! Love the look of that matcha cream! Look at that beautiful green color cream! I could eat a bunch of those!